So here is post four, when I started this process of trying to write a blog on a regular basis I was thinking about 2 a half term but I guess once a term is regular just not as regular as I would have liked. So I am full of admiration for those very busy colleagues who manage to do this on a weekly basis. I started writing this post as a support for my own day to day work. Like all schools in England at the moment we are involved a huge amount of subject based curriculum development and I thought it might be helpful to share the process that we are using to complete this work, it may be that you read it and think this is not appropriate to me which is fine. I would like to make clear that this is not a prescription, its a description, the process we are using to complete the curriculum development activities is organic and developing all the time as colleagues find better ways to do something and others may well have better ways of working. I think we are facing some of the biggest changes in school since the introduction of GCSE and the original NC. This is potentially a huge threat but also a massive opportunity. The pressure for curriculum change is almost overwhelming and coming from different directions the most obvious is the huge range of new government initiatives; NC KS3, then new GCSE and A Level courses from 2015, the tech Bacc amongst others. We also have to consider and act on the improvement in student progress from our feeder primary schools. 5 years ago about 20% or our year 7 intake would be coming with 4a+ and above last year that was over 40% with at least one L5 + and in Maths about 15 young people had teacher assessments of L6 out of an intake of 255. We also have to be aware that this year many Primary Schools have targeted the L6 tests at about 20% of young people and put in place a huge support programme that many Heads of KS4 would recognise from their C/D intervention and A and A* intervention programmes. Having spent some time in a local primary and seen the quality of work that is going on it is clear that even if many of the target students don’t end up with a L6 in Maths or English they have been really well taught and prepared for the tests in a way that goes well beyond cramming. This presents a huge challenge to teachers of year 7 students, particularly in Maths and English but for teachers across all subjects in the school but also an opportunity to improve the overall quality of student experience and success. So schools face the really big issue of an even wider gap between the attainment of the highest and lowest achieving students in the year, which could be from a B to L6 but I suspect that the gap in maturity and confidence in learning will be even greater. For some colleagues the idea that they need to be preparing, planning and teaching work at L6, L7 and L8 in year 7 will be a real challenge, add to this that these will be confident and well trained learners that have experienced highly individualised year 6 programmes including exploring, investigating and researching to a level that might reflect a top year 8 or year 9 student. 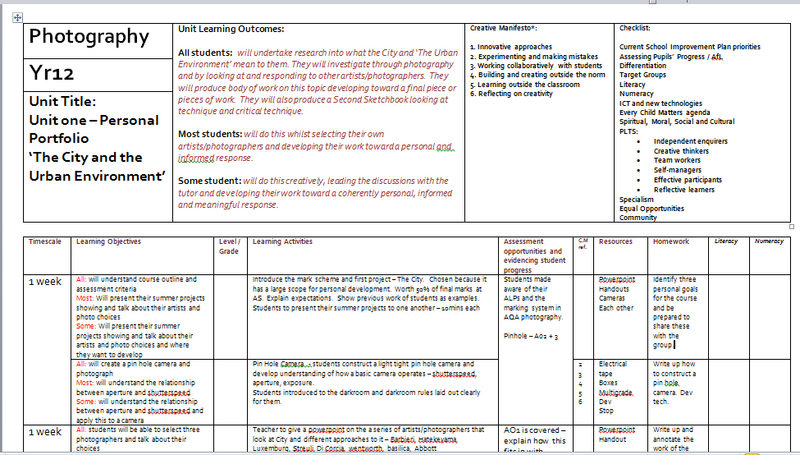 I suspect that in many schools particularly where setting or banding is the normal mode of curriculum organisation, very few teachers will have had the opportunity to teach students who are regularly working at L7 or L8 particularly in year 7 and year 8 so they will not have the ability to visualise what this should look like in terms of student outcomes and learning within their subject. Colleagues who have not taught these kind of levels before will need a lot of support to plan, assess and support students work at those levels. This historical way of proceeding can be reflective of a feeling that curriculum development is a mundane task that has to be completed because it is expected of us rather than seeing it as an opportunity for professional development and departmental reflection on current practice and if it still exists needs to be challenged and removed from school practice as soon as possible. Seeing this as an opportunity for professional development and a time for reflection on current practice creates an opportunity for discussion about improving teaching and learning and building a better student curriculum experience. Again I can see colleagues reading this saying I am out of touch with workload and the requirements of classroom teachers and I would disagree I think the mentality that sees creating new POS as mundane supports a view that curriculum development is an unimportant and routine task in turn further discouraging staff from taking ownership of the taught curriculum. It stops teaching staff from having structured opportunities to develop subject expertise and a sense that they own what they are going to be teaching. For the last two years we have encouraged departments to work in small groups of 3 (or at least 2) that can discuss, explore and engage with the topic for development will create a much more meaningful outcome for students and for the staff that will be teaching the units. If trios can be balanced with experienced and less experienced teachers and those who will be teaching that topic and teachers that aren’t I suggest is helpful and brings greater value to the activity. We encourage staff to look at the requirements for progression at every stage, what does the student need to be able to demonstrate at this level that will help them progress to the next level? The importance and purpose of this document was to firstly check that what was being taught in KS3 made sense, provided continuity of learning, increasing challenge and that assessment activities had been built in at the most appropriate times. We also used this to make sure that all of the skills and knowledge students would need to successfully complete a GCSE course in the subject were being properly developed over the 3 years. Some departments went further with this and looked at the skills for AS and A Level and sought to introduce early elements of these from year 7. We have also undertaken to publish all of our curriculum documentation on the school website so that it is accessible to parents and carers and below is an example of a Yr12 SOW. This is a classic scheme of work format but very unhelpful for parents and students. So to help students take charge of their work and to inform parents and carers about the requirements of the project/unit of work we came up with mini-schemes. This sharing of the big picture with students is very powerful and allows parents to see for themselves where their child is in relation to the work needed within the timeline and is an excellent simple support for teachers in monitoring student progress through the course content. Increasingly we use the mini-schemes as a part of the dialogic marking and assessment process with the teacher providing quick feedback to the student and the student then responds in their book. 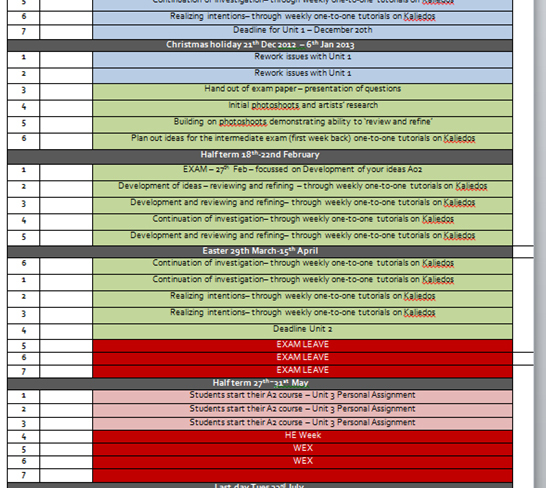 Mini-scheme converted into a quick assessment and tracking sheet.